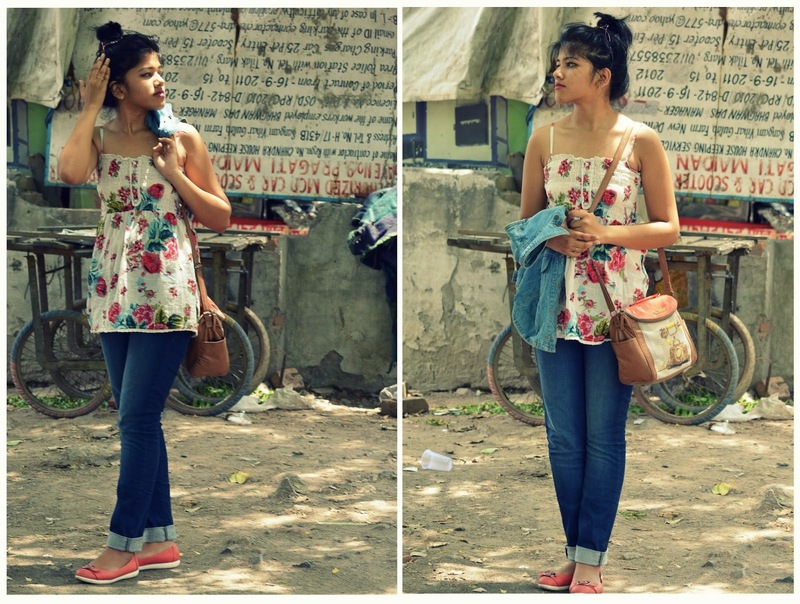 Denim and floral print combination has always been one of my favourites. Floral skirt with a denim shirt, floral maxis paired with denim jackets/shirt, denims with floral print panels or patches, I love ‘em all! I styled a floral print top with a light blue sleeveless jacket, paired with my favourite dark blue jeans for a casual look. I'm carrying my current love, my 3 Mad Chicks sling bag, which I think goes with almost everything, be it a casual outfit or a LBD! I'm also wearing my pink coloured bellies and purple sunglasses, which gel well with the overall look of the outfit. The ensemble is very comfortable for Delhi summer and also gives a fresh look in this crazy heat! This is a work casuals look that I designed for my end term college assignment. The concept for the range was inspired by menswear and Friday Dressing. I am only posting the pictures of my ensemble, rather than the entire range. I designed these blue coloured high-waist twill trousers with a basic grey coloured tank top and a jacket with a double mandarin collar. To balance out the colours, I used welt pockets of the same colour as of the jacket at the front of the trousers. I also used stencil printing to print grey triangles (as our concept required geometric prints) on the hem of the jacket sleeves.